What should have been an easy job turned into a big job as our particular toilet connection for the water source was impossible to connect to the bidet seat. Pink Plumber rectified the problem in a timely manner and with minimal expense considering what was entailed. The next day Marat was back out with a new toilet that could accommodate the bidet and had it installed and functioning in just over an hour. We were very happy with their service and fair pricing. Would recommend to anyone. We had a sewer pipe backed up from roots growing into the pipe which flooded our downstairs about an inch. Richard was the technician that serviced our issue and quickly located the problem within only a few minutes of investigating after his arrival. He was promptly on time and very friendly. He showed us exactly where the roots were getting into the pipe and explained a few different ways of resolving the issue while giving us a few different options to resolve the issue. I was extremely frustrated due to the flooding but our technician's experience and professionalism during this time kept us calm knowing we were in good hands. I would 100% keep The Pink Plumber on my list of services to contact in the future should I ever need them again, and fully recommend them to anyone needing true professional plumbing services without feeling nickel and dimed over costs. Thanks to The Pink Plumber and Richard Q. for getting our flood under control before any real major damage to occur. The dispatcher was friendly, reassuring, professional and quick; Michael M. was prompt, friendly, informed and informative, and fully competent. What more could one ask for! Thomas "TJ" did a great job; he arrived on time and was able to complete the job quickly and as inexpensively as possible. Highly recommend Pink Plumber, and specifically, TJ! Marat S. did an excellent job today fixing my clogged drains. I was extremely impressed by his professionalism and in-depth knowledge of his trade. He explained everything he was doing and showed me exactly what the problem was. He even gave me several options for how to fix it in a way I could afford. He had a very good attitude and was very kind and respectful as well. If I ever need another plumber at my house, I am going to request him by name. Thanks Marat, for a job well done! Thanks, Felix, for keeping it real and advising me of potential issues before the work even started. Professional and thorough. I had my disposer replaced and a piece in the kitchen sink replaced as well . Marat S .which was the guy that did the work was very knowledgeable of his work and professional thank you so much great job. AWESOME. GREAT. SUPERB. HE'S THE BEST. Felix arrived on time with a happy to help and friendly demeanor. He was very knowledgable and gave multiple options to solving my issue. My water heater was very old and I ultimately decided to replace it. Felix completed the installation top to bottom the same day. He gladly answered any questions I had and was even great with my very anxious dog. I will absolutely call them for any other issues I have in the future. He made a frustrating situation much much easier. Very professional and courteous, him and his partner worked very hard. Never gave up and fixed a major problem we had that would have cost us thousands I would recommend these fellas to anyone. While I was visiting my daughter in Auberndale, FL, she needed a new garbage disposal. We called The Pink Plumber on 12/18 or 12/19 and Felix R. came to the house on 12/20. Felix was very professional but friendly. My daughter had purchased a disposal but when Felix looked at it he told us he would recommend a stronger disposal. Since I had replaced mine at my home I agreed with him that a larger one would be better. He installed the disposal and told us how it worked and what items should not be put into the disposal and that water should be run after the disposal is turned off. Great information. I highly recommend The Pink Plumber company and Felix R.
The Pink Plumber is a fine establishment. Felix Rivera is an outstanding service technician. He was both professional and polite. He explained all my options very clearly and concisely. Being on a limited budget he worked with me on the pricing as best he could, even calling his supervisor to see if he could make things more affordable. Hence the pricing was very fair. Felix performed his work both thoroughly, neatly and in a timely manner. I noticed too that he was training his assistant at every turn. The water heater install looks and works great! Showed up as agreed..replaced ball (isolation) valve after tech broke original even tho I asked for it NOT be replaced, as it had not been operated for more than 8 years, and there are 2 other isolation valves upstream,including the street valve. This resulted in additional (non necessary) cost, to me, eliminating any discounts that were advertised. I am very unhappy with the "Upsell" and general deceit in this service and company. I will NOT be recommending this company to anyone My rating on this is ONE on a 1-5 scale. What goes around comes around. Hope the extra $$ make up for my dissatisfaction! This is a great company to do business with. I called in the morning and was greeted by a very pleasant receptionist. She took my information and scheduled the appointment. 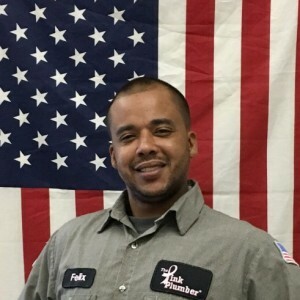 I was called by Felix R. a couple hours later and he arrived when he said he would and quickly diagnosed my plumbing problem and fixed it in a very professional manner. I was emotionally attached to my 70 year old toilet but Felix sold me on the advantages of letting her go and replacing with a new one. It was a tough job to replace her but I could not be happier with the new one.. It works like a charm. Very clean too. Usually when you get this type of work done there is some debris left over but Felix made sure the bathroom was left just like is was when he entered it. Great job!!!!. Felix and Andrew were consummate professionals and were able to quickly correct an amateur job that had went horribly wrong. They laid out options and timelines and were very friendly. I plan to use them again in the future and would recommend them without hesitation. Felix R. was my technician. He was at my house within 1.5 hrs of calling, promptly evaluated the problem and then offered me three options, including his recommendation for the best solution. The pricing was straightforward and easy to understand. He also helped me with getting the membership discount - which came out to more than the cost of the membership. He then got right to fixing the issue, and now, only 2 hours after calling, I'm all set and the problem is fixed! Thanks Felix.